P.V. 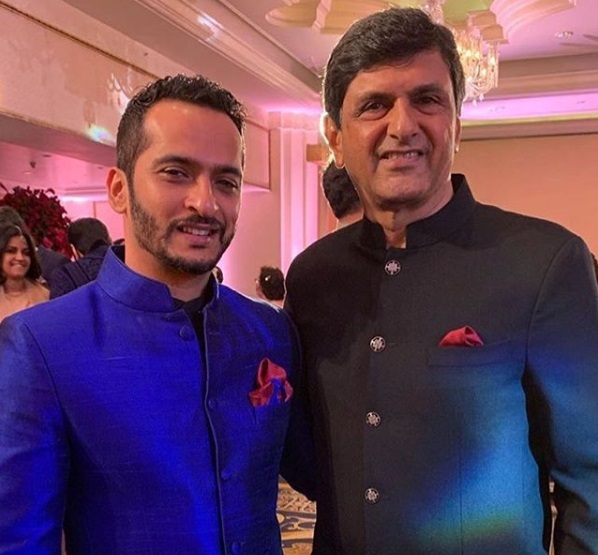 Sindhu, Anil Kumble, Gopichand and others attend Ranveer Singh, Deepika Padukone’s wedding reception in Bengaluru. The country is not going to get over with the pictures of the newly wed couple of Bollywood. 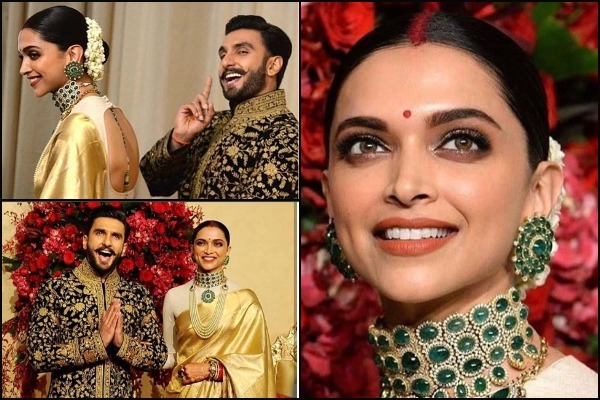 The silver screen Bajirao Mastani screamed royalty and appeared to be real life king and queen at their wedding reception in Bengaluru. 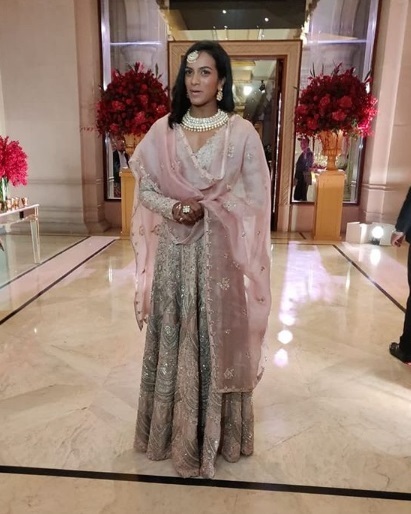 The IT couple of Bollywood hosted their first wedding reception for their friends and extended families yesterday at Leela Palace in Bengaluru. 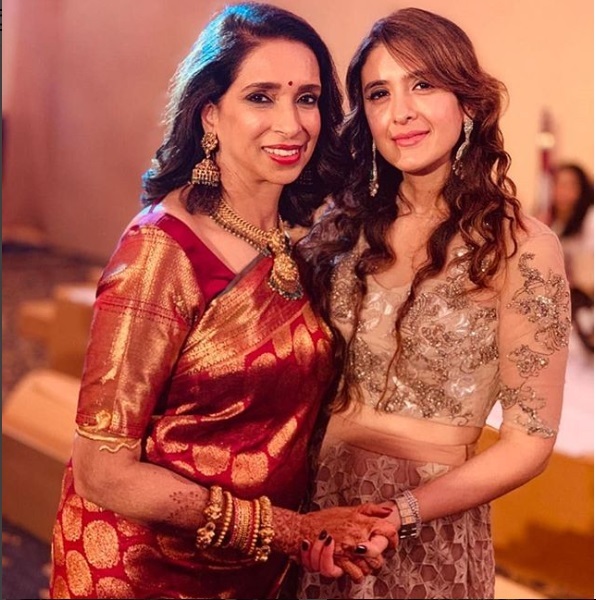 After sharing inside pictures from their Italy wedding festivities on social media, the couple went on to skip our hearts beats with their another so lovely and cute chemistry at their wedding reception in Bengaluru. As Deepika had balanced two different looks for her – south Indian and North Indian wedding, that’s what she opted for her reception too. Being a South Indian girl, Deepika wore a nine yard pure zari gold kanjivaram silk saree with a long sleeve blouse gifted to her by her mother Ujjala Padukone from Angadi Galleria, designed by K Radharaman. We loved the fact that she finished off her look with a Sabyasachi’s heavy choker emerald jewelry with multi-layered string of pearls. Her make-up was on point with brown smokey eyes and rustic lip color. Like any other new bride, Deepika wore sindoor in her signature sleek parted hair-do and a mogra in her bun. Her radiant smile with dimple is expressing her happiness. Whereas ladkewale Ranveer Singh donned heavily embroidered black and gold Rohit Bal sherwani and matching shoes. The golden work on his embroidery is complementing with the saree color of his lady love. Of course he is rocking that beard look. 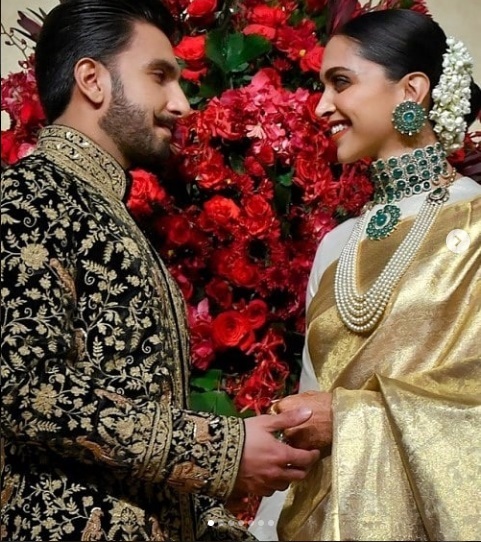 Ranveer has openly expressed his love for Deepika even before they made their relationship official and now that they are husband and wife, we can see the contentment on his face. Ranveer at his best giving us couple goals while helping his wife Deepika with her saree and gives a flying kiss to her. Awwie!! Sports celebrities P.V. Sindhu, Gopichand, former cricketer Anil Kumble and Venkatesh Prasad were among the sports celebs attended DeepVeer’s Bengaluru reception party. 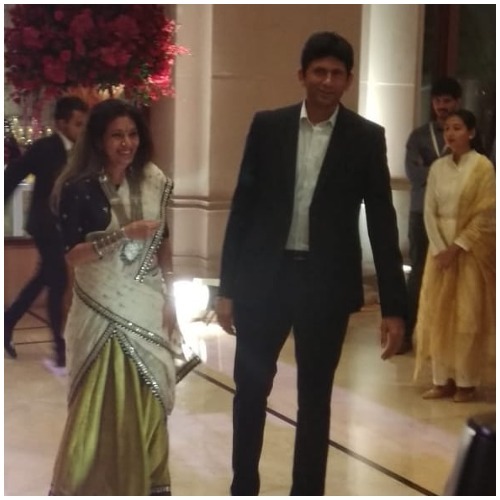 Ujjala Padukone, dietician Pooja Makhija, Prakash Padukone were seen posing with their guests at the wedding reception. Ranveer Singh and Deepika Padukone tied the knot on November 14 and 15 at Lake Como in Italy. Subscribe with Eventznu and Follow us on Facebook as more pictures and videos from #DeepVeerReception will roll on.